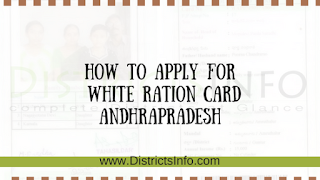 White Ration Card in Andhra Pradesh: A ration card is a very useful document for Indian citizens. Ration card is an official document which gives legal right to a person in India to use different benefits like food, kerosene, and other goods to use. This card helps them when buying rice, wheat, kerosene, sugar etc from a shop authorized by the Indian government. Ration cards have been used since World War 2 and still, they are in existence and with more importance now. Especially for poor people, it is an important card as it helps them to use government facilities at a low price and also helps them as an identity proof. White ration card is provided in Andhra Pradesh to people who are above BPL with income less than 1 lakh. So till now people having a much higher annual income are also enjoying the benefits of white ration card. But now the government is making some amendments to take care of these things, as the benefits must reach to our poor people. The income limit for this white ration card is less than 1 lakh. But till now people with much higher income also are using this card. The most interesting fact is that according to 2011 census, there were 10.68 lakhs white ration card were there and only 8.76 lakhs households. By seeing these facts now the government has decided to check these card details again from beginning to reduce fake white ration card holder. * Fee reimbursement for students who are not able to provide their fee for their studies. * If anyone wants to purchase or register a land, white ration card plays an important role. * White ration cards also helps in getting a free medical assistant in Arogyasri hospitals. * Old age citizens can easily apply for pension using this card, also they can show this card to take their pension if they are not getting it. * People can get gas subsidy easily with this ration card details. * While applying for passport or visa, the white ration is a valid proof. * Income must be below 1 lakh/annum. * Must be a resident of Andhra Pradesh. * Must be above BPL (Below Poverty Line). * Should not have applied for any other ration card before. * Get the application form from Mee Seva or AP online. Also, directly you can download it from the link given here: Ration Card Application Form. * Fill the form and all the details with your family details correctly asked in that application form. * Now submit this application form in your nearest Mee Seva center. * After paying the registered amount, you will get a slip. * Enquiry will be done about your information given in the application form. * Once the inquiry is done and the remaining process is over, you will get your white ration card immediately. * 3 Passport size photo of the beneficiary. * Family photo attested by any gazetted officer. * Annual income proof of the family. * House tax and residence proof, if you are an owner of any house. 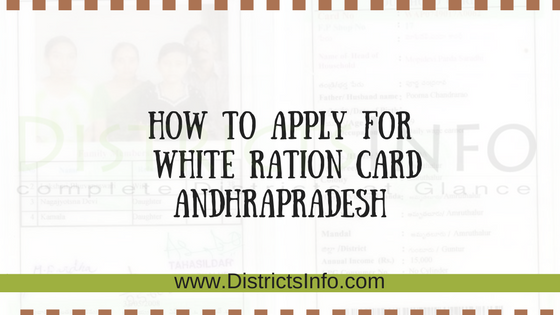 White ration card is one of the most powerful identification proof in Andhra Pradesh now. Even for opening a bank account, you need to have this white ration card. So bu reading this article you will come to know all the information you want to know about white ration card. So just a simple process is there to apply for this white ration card as we have told above. Apply for this ration card and enjoy the benefit which can help your family in many better ways. my mom is retired employee and she is getting pension of 1,32,000 rs per annum. Is she eligible to get white ration card?